An updated build ( older ones below ), This is a after a lot of testing and community feedback. The Rift forum mages busy with pharse runs and macro jiggling. In short this is the top single damage build so far. OLDER builds: Less cast time, more movement friendly. A build with very little cast time, lots of instant casts high mobility. The only real reason im posting this is because i find it fun to play, it seams to pull more than ele and harb im not sure as its broken atm. And besides, not like thers many more out on this forum yet. In short, you open with IGNITE once u have FIRE STORM on the floor you can then press the “NUKE / PRAY” Macro twice and begin praying to RNGesus, this can go one of two way. Whatever the outcome, keep mashing the “SPAM MACRO” and refresh IGNITE when required. I even made u a Kalaert to keep track of it :3. You can “NUKE / PRAY” every 30 seconds, use it on cooldown. DISCLAIMER: This could turn out to be rubbish compared to some specs people will no doubt invent or find as time goes on in SFP,But for now i like this, i like making things go BOOM! HOWEVER! It can go for over 5 minuets without mana running out, this is a huge difference to the main build that lasts anywhere between 1 min 40 - 2mins 30. Last edited by QIao; 12-05-2016 at 01:40 AM. What legendary s are you using? And the site i originally posted it on i had a picture of the soul tree instead of using Magelo and forgot it didn't have legends on yet. Last edited by QIao; 11-23-2016 at 04:36 AM. This is exactly what I was looking for, something I can nearly mindlessly click during IAs, haha. Much appreciated. Your welcome Roll on IA's being active again! sad thing is this is the highest ST dps spec out atm ha ha ha. Pretty sweet. Seems to be the highest spec for me atm. 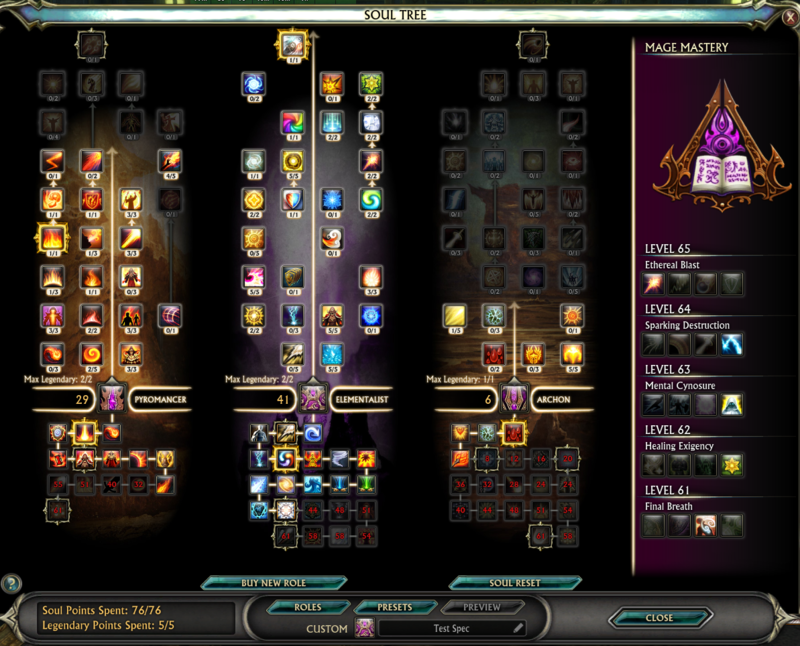 Finally got into and expert as dps, and yeah the damage rivals other classes no more dead last! just one question.. why did you take flicker in pyromancer? It does not add to damage on its own.. or is it because of filler/cd/timers? Last edited by Aranka; 11-25-2016 at 06:49 AM. This spec will parse lower once Flame Bolt bug is fixed. Only when i move around then the whole spam list is casted..and when cinder procs then i spam this macro and it never gets casted..something is wronmg..can you help me out here anyone ? Last edited by Psycrow; 11-25-2016 at 01:20 PM.